Hold on to your pants acoustic guitarists, you probably ain't seen many (if any) like Mark Kroos. 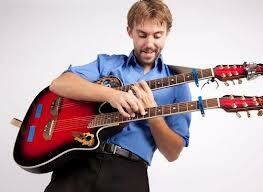 Using a double necked guitar Mark taps different rhythms, leads and harmonies simultaneously on both necks. From his website: "Mark Kroos plays 2 guitar necks at the same time. Originally from Lansing, MI but currently based in Williamsburg, VA he is one of the only people in the world touring his trade." Talk about the left hand knowing what the right hand's doing! Now watch this guy closely, his hands don't leave his body.